This Year is off to a running start in the hair department. If you were looking for fresh new excuses to throw some gorgeous shades of color onto your hair, look no further; the galaxy hair trend is here to stay. What is Galaxy Hair? Hair that looks like a galaxy? What is galaxy hair, you ask? 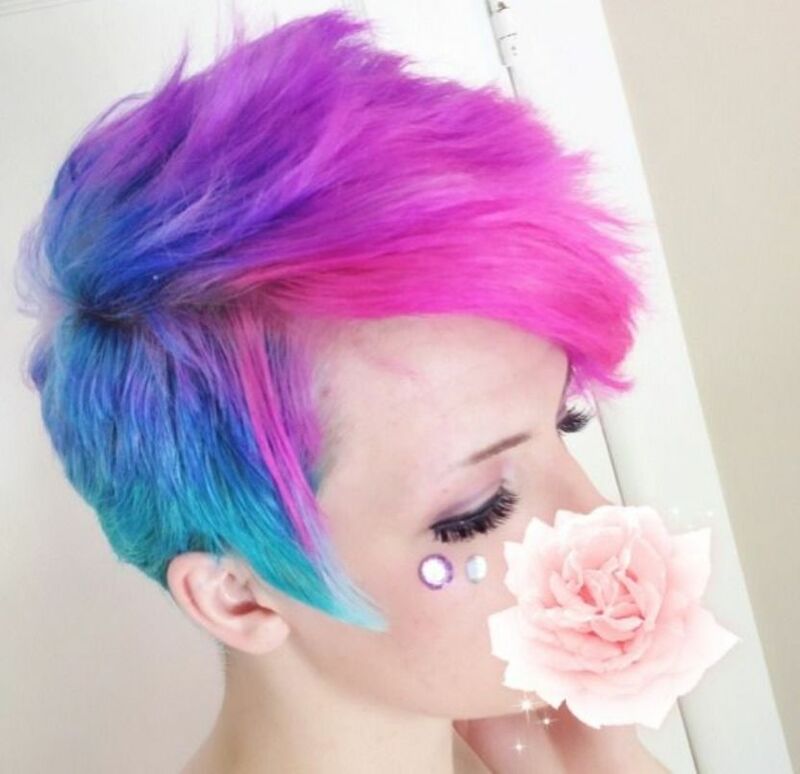 Galaxy hair is achieved basically by mixing rainbow and pastel hair colors to create something beautiful. What makes it stand out from just any other hair color variation is that every hairstyle’s coloration matches that of different parts of the galaxy. Fair warning—the result is breathtakingly awesome! Before you feast your eyes on some of the best galaxy hairstyles out there, it is important to note that creating galaxy hair can take hours depending on the number of colors you use. Also, there is quite a bit of maintenance required to prevent the colors from looking washed out. Feel free to grab some inspiration from these 7 stunning galaxy hair ideas. Short hair is no excuse when it comes to galaxy hair. It is still very possible to achieve stunning results by mixing a few bright rainbow colors with some muted pastels. Here, a subtle color transition from black to blue, to purple, and finally to pink creates a stunning night sky galaxy illusion which is only enhanced by the short, messy layers of the pixie cut. Throwing in a shade of ashy gray randomly gorgeously wraps up what is one of the best galaxy hair ideas for people with short hair. If you’re not ready to fully commit to the look, galaxy hair can be achieved without necessarily dyeing every inch of your hair. This superb example shows how naturally dark hair color can be combined with bright streaks of purple and blue and muted hues of gray to create a stunning galaxy-inspired hairstyle. The wavy texture of the locks further intensifies the look by giving it a stormy finish—exactly how you would expect the galaxy to look like. Without having to use deeply saturated colors or even a wide array of colors, you can still create a fantastic galaxy-inspired hairstyle such as this one. Once again, the naturally dark color of the hair has been used to create a stunning transition to the lighter shades of purple towards the ends. Highlighting the resulting look with touches of platinum blonde gives it a naturally lustrous finish which, thankfully, will not require as much maintenance. This is one of the more intricate galaxy hair ideas and to pull it off by yourself, you will need a few more hours and a lot more hair color. Looking at the way the purples and the blues have been blended so seamlessly, however, it is totally worth the extra effort. The short, spiky layers are surprisingly conducive to the look especially thanks to their slightly swirly appearance. For an even better finish, one section of the hair has been left dark to create breathtaking gradient hair. Artistic hairdos such as these should be left to the pros but if you trust your skills, pulling this off would be totally worth the time and the effort. The color variation consists of subtle jewel tones including emerald green and sapphire blue with touches of purple which complement the dark color of the hair flawlessly. The icing on the cake is without a doubt the wavy finish that boosts the volume of the hair and gives it a superb A-line outline. This glorious pixie is as elegant as it is edgy thanks to its bold spikes and superbly placed tones. Using analogous colors such as blue, purple, and pink is a great way to create such vibrant hair albeit more than a bit of skill is required to get the color placement right. Using lighter tones on the edges while keeping the roots darker is one way to superbly pair those shades in order to end up with a look that is as fantastic as this. Whether your hair is straight or curly, jewel tones will always give it an attractive twist with just the right amount of mystique. This beautifully straight-haired galaxy-inspired look features intricately placed streaks of green, purple, and blue with just the right amount of saturation to help each individual streak to stand out. Feather-light brushes of platinum on the edges of the hair gives it an interesting twist. Finishing it with matte-textured hair is a unique way to show off the colors. Creating galaxy hair will require a lot more of your time, effort, and patience, not to mention a lot more hair color. The color choices will largely be dependent on the exact type of look you’re going for (whether it’s the cosmic purple and blue blend or the aurora-themed green, blue, and purple) but whatever you go for, get it in abundance since it takes a lot of colors to achieve the perfect saturation. The tutorial is relatively simple (only involves sectioning, dyeing, and washing hair) and can take varying amounts of time depending on how good you are with a brush and how many colors you choose to go with. Brushes for each color option. Mixing bowls for each color option. Hair color (Jewel tones; Pravana comes highly recommended). This involves shampooing, conditioning, blow-drying, combing—the works. Your hair should be undyed (preferably) before you begin preparing it for the next dyeing session. Sectioning your hair and holding it with clips makes it a whole lot easier to apply colors to different sections and to wrap them individually in order to prevent bleeding. You can go for two to three levels to give it some depth and dimension. Dye individual sections one at a time with alternating colors (i.e. blue, then green, then purple, then green, then blue). You can replicate a look you’re already familiar with or create a completely different style. Just make sure you use plenty of colors to get that richly saturated finish. For the sections you don’t want to bleed, you can use plastic wrap to keep them separated. Repeat the process until satisfied. Give the color plenty of time to dry (45 min to 1 hour) before giving your hair an ice-cold rinse and drying it. Congratulations, you now have a stunning nebula of beautifully colored galaxy hair on your head!